I loved Water for Elephants by Sara Gruen. It was one of those rare books that interested my husband first and he easily talked me into reading it. When we heard Gruen had a new book, Ape House, coming out we thought it would be great fun (??) to read her other titles first. 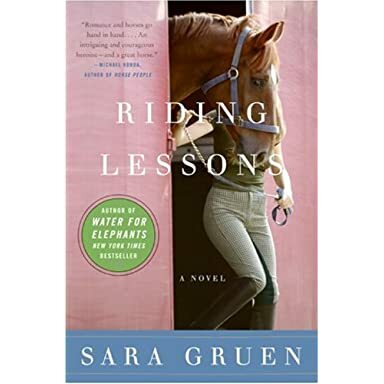 Riding Lessons, published 2 years before, shows Gruen's love of horses and riding. As a world-class equestrian and Olympic contender, Annemarie Zimmer lived for the thrill of flight atop a strong, graceful animal. Then, at eighteen, a tragic accident destroyed her riding career and Harry, the beautiful horse she cherished. Now, twenty years later, Annemarie is coming home to her dying father's New Hampshire horse farm. Jobless and abandoned, she is bringing her troubled teenage daughter to this place of pain and memory, where ghosts of an unresolved youth still haunt the fields and stables—and where hope lives in the eyes of the handsome, gentle veterinarian Annemarie loved as a girl . . . and in the seductive allure of a trainer with a magic touch. But everything will change yet again with one glimpse of a white striped gelding startlingly similar to the one Annemarie lost in another lifetime. And an obsession is born that could shatter her fragile world. Annemarie hasn't bothered to pay much attention to her life since that long-ago accident. Quickly after her recovery she married, had a child and completed a degree. Still she's been on hold and it isn't until her husband announces his affair and desire to leave the marriage that Annemarie takes some kind of action. She runs away to New Hampshire with her daughter, the daughter who is generally mad at her! She lacks parenting skills-big time-both my husband and I were stunned by many of her choices. She seems spoiled and self-centered and worthy of an epiphany! Thankfully, she does grow by the end of the novel or I wouldn't be so interested in reading the sequel, Flying Changes. I think actually I liked her daughter, Eva, best. I wouldn't be getting upset over a tiny unicorn tattoo!! I did enjoy the horse conversation as I've wanted a "pony" since I was 12 myself so I lived vicariously through Annemarie's and Eva's farm journey. It shows Sara Gruen is not a one-hit wonder and she shares her deep passion for animals with us. Hmmm, maybe I want to pre-order Ape House!! This gives me another entry inHomeGirl's 2010 Library Challenge. Think you want to own it-click here. Oh, Saturday I Embrace You! !